At Spectrum Electric, we're firm believers in the responsibility each of us has to reduce our negative impacts on the environment. With the average American now producing about 1600 pounds of garbage a year, it's more important than ever to make changes that will contribute to the longevity of our planet. Of course, recycling is a great way to become part of the solution, and more Americans are becoming increasingly aware of its benefits daily. The more we recycle, the less we emit carbon and other greenhouse gases. Did you know that you can also significantly reduce the carbon output of your home by switching to an LED lighting technology? Recent estimates suggest that almost 50% of our carbon emissions are the result of electricity usage, with lighting representing a staggering 17% of our total carbon footprint. That's a huge number, and one that can easily be reduced by making the switch to an energy efficient lighting solution. 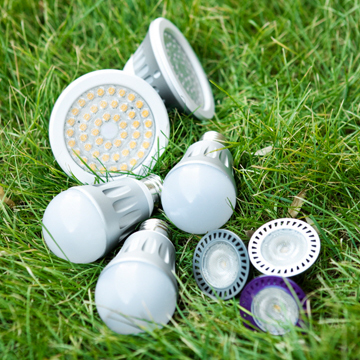 LED lamps consume a small fraction of the energy of incandescent bulbs, contain no mercury, and last over 50 times as long as typical incandescent bulbs. By switching to an LED solution throughout your home, you can reduce your yearly carbon emissions by 6 tons. That's almost 6 times the amount of carbon produced by the garbage you throw away every year. So, it should be clear that the environmental benefits of LED lighting make them certainly worth considering, but what of the cost-savings benefits associated with their use? While it's true that LEDs are more expensive that their incandescent or CFL counterparts, it's also true that their cost has come down significantly over the last couple of years, making the total expenditures associated with replacement much lower than you might expect. When you also consider that most LEDs have a functional lifespan of around 10 years, versus around 100 days for a typical incandescent, it's easy to see that there are significant cost savings to be had based on replacement expenditures alone. In addition, by replacing the lamps in your home with LEDs, you can realize a reduction of 60% to 90% of your lighting-related electricity usage. With the cost of today's utilities, that's no small amount. Spectrum Electric specializes in consultation and installation of LED technology in the home or office. As Florida distributors for several best-in-class LED solutions, you can be certain that we'll provide you with the highest quality LED lamps at the lowest possible prices. If you already have LED lighting in place, we're experts in the field, and can help make certain you're utilizing the technology to its maximum potential. We're also experts at servicing all LED solutions, so let us know if you're in need of service or maintenance. We'll be happy to help.